What Happens if You Get Caught Concealing a Weapon Without a CCW in California? In California, a concealed weapons permit, or CCW, allows a permit holder to carry a loaded weapon on his person in a concealed manner. California does not recognize concealed carry permits from other states, so only California permit holders can carry concealed weapons in the state. If you violate California’s concealed carry laws, you could wind up in jail and pay hefty fines. Without a CCW, you could be found guilty of a crime under section 25400 of California’s penal code. This law prohibits anyone without a permit from carrying a pistol, revolver or other firearm capable of being concealed while that weapon is on his person, and it prohibits you from placing weapons that could be concealed on your person in your vehicle's glove compartment or under your seat. Generally, violations of this law are punishable by up to a year in jail and a fine of up to $1,000. If a person convicted under this law has previously been convicted of certain misdemeanors or a felony, California law sets a minimum jail time of at least three months. If the firearm is stolen, the concealed carry is a felony, as is a concealed carry if the person carrying it is an active participant in a criminal street gang. What Is Needed for a Concealed Weapons Permit? 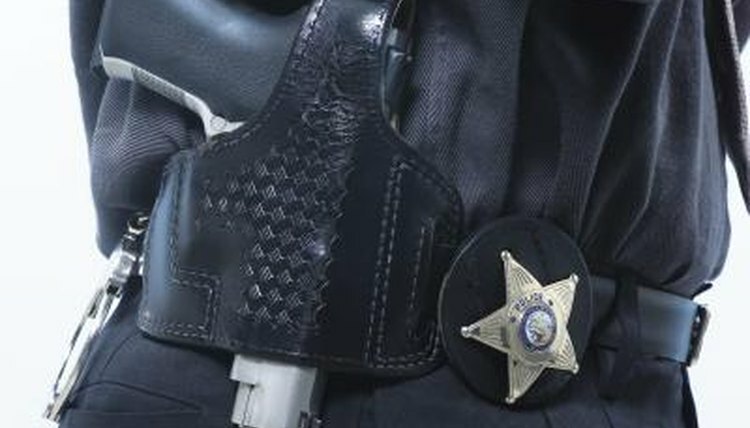 The application process for a concealed carry license varies depending on where you live since local authorities, such as county sheriffs and chiefs of police, are the issuing authorities. Generally, the first step of the process requires you to submit a standardized paper application and pay application fees. Next, you must attend an interview with your issuing agency and have your fingerprints taken. Your issuing agency can require a second interview along with a psychological evaluation, but these requirements vary by location. In counties with populations of less than 200,000 people, you can obtain a modified permit that allows you to carry a loaded but exposed firearm. Without this permit, weapons that are openly carried must be unloaded, but this permit is only available in counties with a population under 200,000. California will only issue CCWs to individuals who are of good moral character, have good cause to justify the permit and have attended an approved firearms training class. Wanting to exercise a Second Amendment right is generally not considered good cause, and good cause typically means you or your family are in some type of danger that could be mitigated if you were allowed to carry a concealed weapon. For example, a judge or defense attorney might have good cause because of the dangerous nature of his work. You must meet all these qualifications and be a resident of the city or county where you are applying or spend a substantial period of time in that location for business purposes. The issuing authority has almost complete discretion to issue or deny your license. Even the California courts will not review such decisions except under limited circumstances. If you otherwise meet California’s legal requirements for a CCW, you can still be disqualified if you fall into certain categories based on your past behavior. For example, if you have been convicted of a felony, domestic violence offense or certain misdemeanors, you cannot possess a weapon under California law; thus, cannot obtain a CCW. If you are addicted to narcotics or have been diagnosed as mentally ill, you also cannot obtain a CCW. Even if you obtain a CCW, the permit does not give you permission to carry whatever you want, whenever you want. Other California laws still apply that prohibit certain types of assault weapons, explosives and other weapons. You also cannot brandish your weapon in a threatening manner unless you are doing so in self-defense. Frances, Heather. "What Happens if You Get Caught Concealing a Weapon Without a CCW in California?" , https://legalbeagle.com/12300680-happens-caught-concealing-weapon-ccw-california.html. Accessed 19 April 2019. How Do I Get a Gun License in Alabama?